[AUTO](VC):When placed, Soul Charge (1), and this unit gets [Power]+2000 until end of turn for each card in your soul. 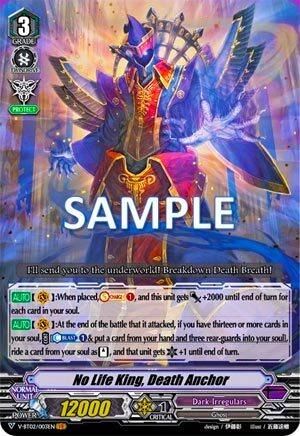 [AUTO](VC):At the end of the battle that it attacked, if you have thirteen or more cards in your soul, COST [Counter Blast (1) & put a card from your hand and three rear-guards into your soul], ride a card from your soul as [Stand], and that unit gets [Critical]+1 until end of turn. Oh BOY. Far cry from the pseudo-Megablast that he used to be. So his on-ride makes him decently meaty as well as fuelling himself for the second skill. As for the odds of GETTING the second skill…it’s decent, assuming you dedicate most of it to Soulcharging, but I haven’t seen many people get Death Anchor off on the turn he appears: it’s usually one turn later assuming their hand isn’t absolute gobshite. His second skill, talking of which…ah yes, -4 to then +3 back overall (but 3 of it’s on the field so it doesn’t compromise hand guarding too badly, plus an extra Protect Gift is nice) to gain Demon Eater (if you need Sentinel sealing) or just another Death Anchor to start the fun again next turn. Considering his ludicrous soul requirements odds are good you’ll get either one or the other in the soul, and even then just riding Death Anchor again if not will still +0 wash you with a Protect Gift and set you up anyway. The extra Critical is just the icing on the french fancy and it means you don’t fluff checked Criticals. Solid stuff in a card: meaty re-stand and an extra Critical. 4-of staple.